The Kirk Papers is a collection of photographs and papers belonging to East Africa pioneer Sir John Kirk. It was acquired for the National Library of Scotland in 1998/1999 with the help of a grant of £55,000 from the Heritage Lottery Fund. 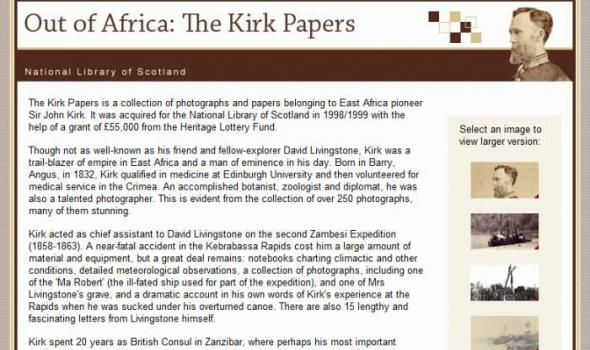 Though not as well-known as his friend and fellow-explorer David Livingstone, Kirk was a trail-blazer of empire in East Africa and a man of eminence in his day. Born in Barry, Angus, in 1832, Kirk qualified in medicine at Edinburgh University and then volunteered for medical service in the Crimea. 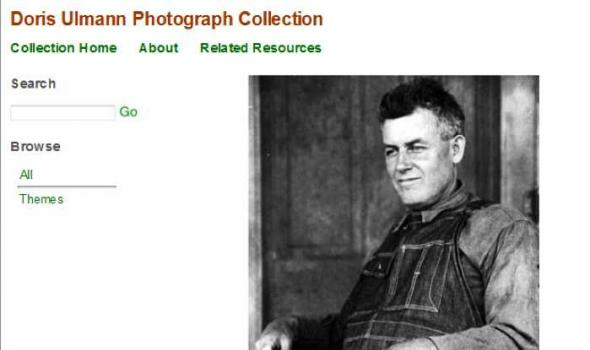 An accomplished botanist, zoologist and diplomat, he was also a talented photographer. 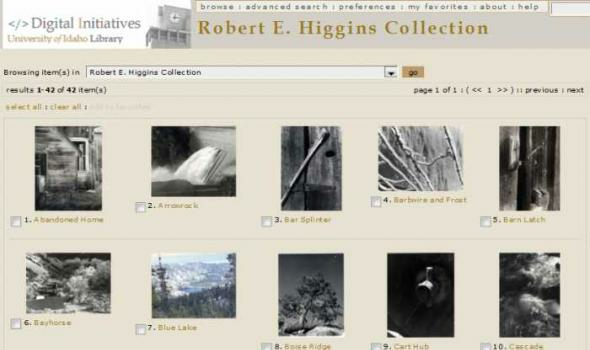 This is evident from the collection of over 250 photographs, many of them stunning. 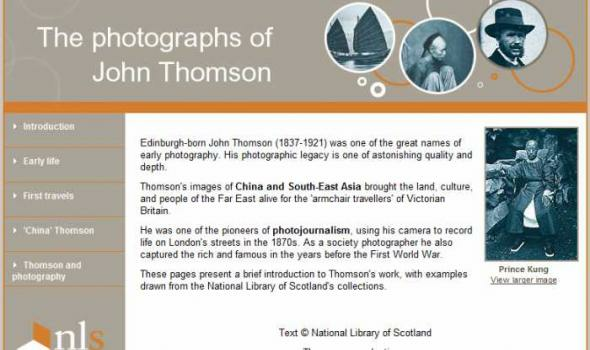 Edinburgh-born John Thomson (1837-1921) was one of the great names of early photography. His photographic legacy is one of astonishing quality and depth. Thomson's images of China and South-East Asia brought the land, culture, and people of the Far East alive for the 'armchair travellers' of Victorian Britain. He was one of the pioneers of photojournalism, using his camera to record life on London's streets in the 1870s. As a society photographer he also captured the rich and famous in the years before the First World War. 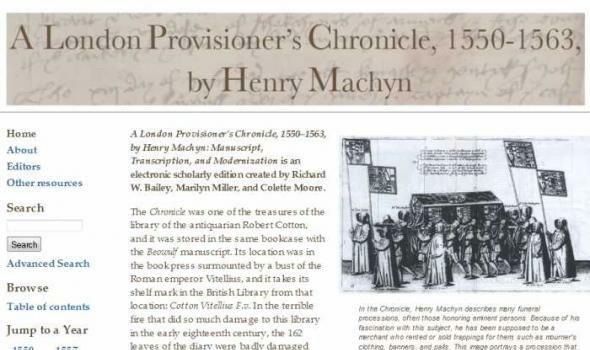 These pages present a brief introduction to Thomson's work, with examples drawn from the National Library of Scotland's collections. 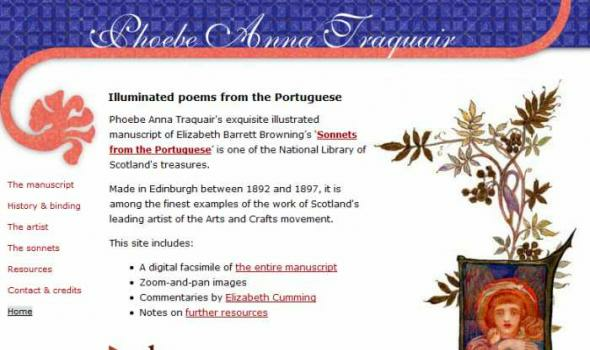 Phoebe Anna Traquair's exquisite illustrated manuscript of Elizabeth Barrett Browning’s ‘Sonnets from the Portuguese’ is one of the National Library of Scotland's treasures. Made in Edinburgh between 1892 and 1897, it is among the finest examples of the work of Scotland's leading artist of the Arts and Crafts movement. 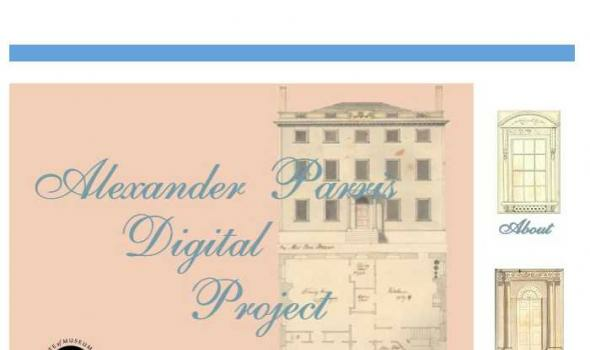 The aim of the VICTORIAN WOMEN WRITERS' LETTERS PROJECT is to make available through electronic publication the correspondences of early to mid-Victorian British women writers in a form that attempts to capture the multiplexity of epistolary communication. 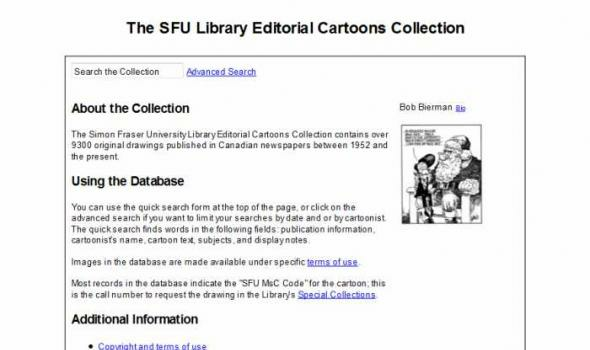 This was the background leading to the founding in 1965 of the Vancouver based Alcuin Society. The chief aims of the Society are “to further the interests of book collectors and to promote a wider appreciation of fine books…”. To that end the Society provides a wide range of book oriented activities, including since 1981 an annual Awards for Excellence in Book Design in Canada. The Society continues to flourish. The Society’s From Hand to Hand: A Gathering of the Book Arts in British Columbia… (1986) is a very useful introductory although dated directory of British Columbia fine printing and book arts. 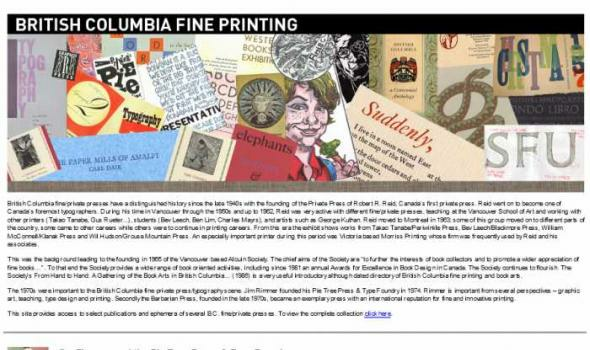 The 1970s were important to the British Columbia fine private press/typography scene. 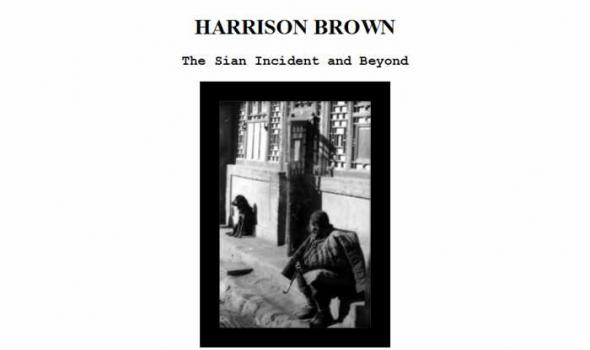 HARRISON BROWN The Sian Incident and Beyond "Harrison Brown: The Sian Incident and Beyond" is a chronicle of author and journalist Harrison Brown's voyage to China between 1936 and 1937, and the events that unfolded during that time in what has become known as 'The Sian Incident'. The events are presented largely through the eyes of Harrison Brown himself - 'H.B.' as his friends called him - through the journals that he kept during his trip, the photographs he took, and the articles and manuscript that he wrote during and after his journey. 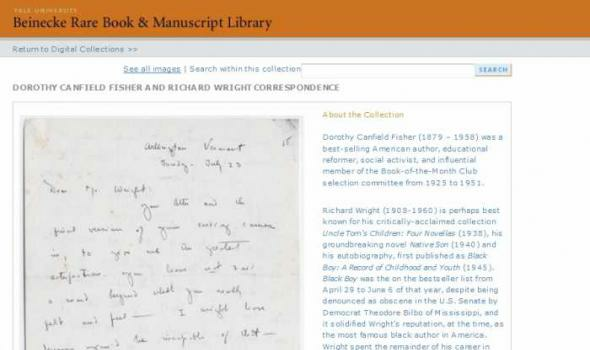 You may browse through a collection of 137 of H.B's photos, his 22-chapter manuscript "On the Trail of a Freelance", his original hand-written journal pages, and much more. Doukhobor Collection of Simon Fraser University About the Collection The Simon Fraser University Library Doukhobor Collection is comprised of over 700 primary source items (totaling over 3,300 images) dating from 1898 to 1975. 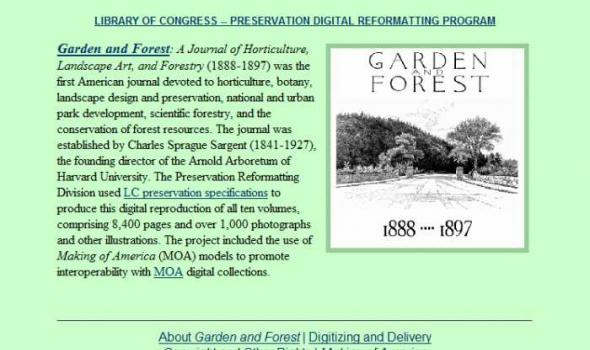 Among these items are a variety of scanned manuscripts, photographs, books and book chapters, journals, magazine articles, financial documents and interviews. 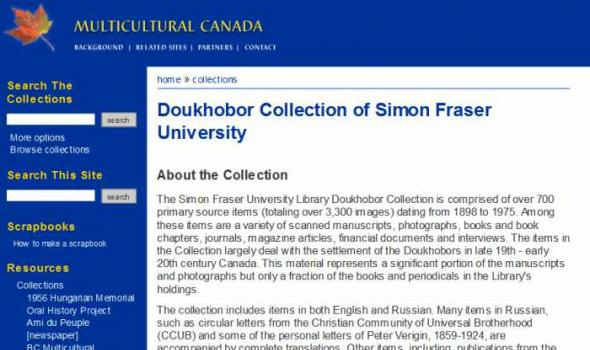 The items in the Collection largely deal with the settlement of the Doukhobors in late 19th - early 20th century Canada. 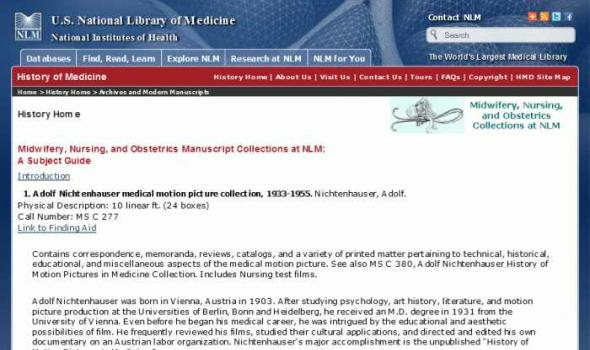 This material represents a significant portion of the manuscripts and photographs but only a fraction of the books and periodicals in the Library's holdings. 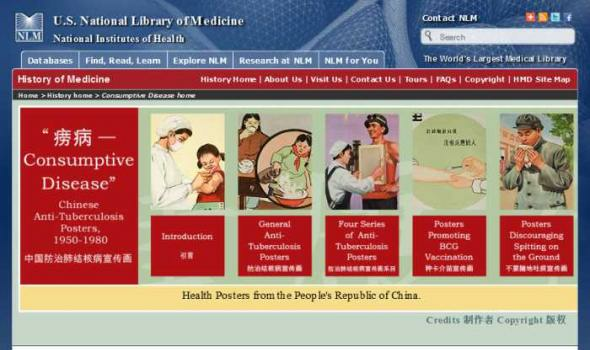 The collection includes items in both English and Russian. 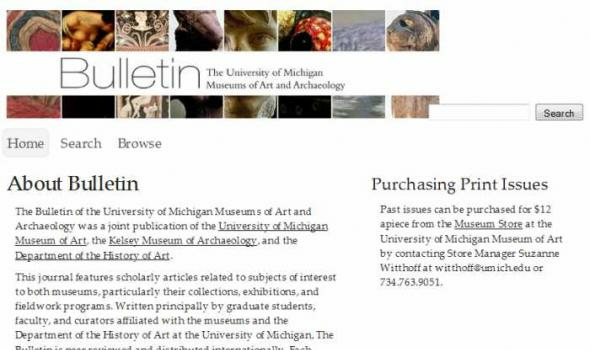 Purchasing Print Issues Past issues can be purchased for $12 apiece from the Museum Store at the University of Michigan Museum of Art by contacting Store Manager Suzanne Witthoff at witthoff@umich.edu or 734.763.9051. 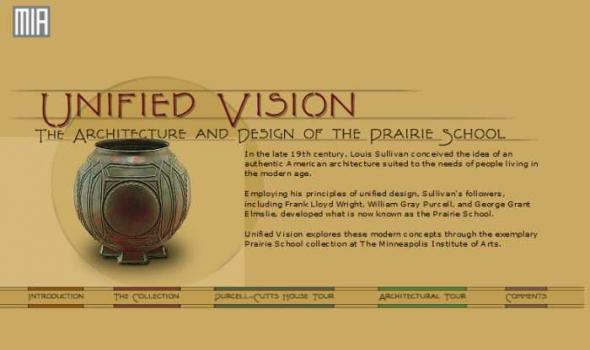 About Bulletin The Bulletin of the University of Michigan Museums of Art and Archaeology was a joint publication of the University of Michigan Museum of Art , the Kelsey Museum of Archaeology , and the Department of the History of Art . 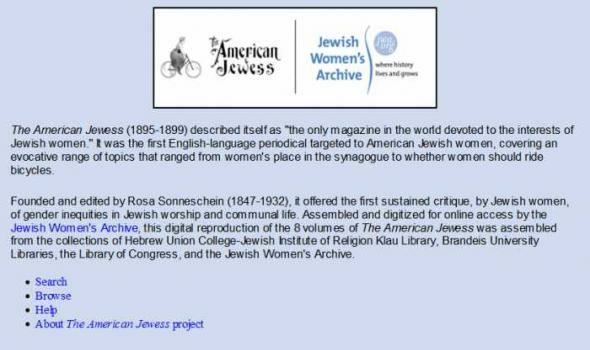 This journal features scholarly articles related to subjects of interest to both museums, particularly their collections, exhibitions, and fieldwork programs. 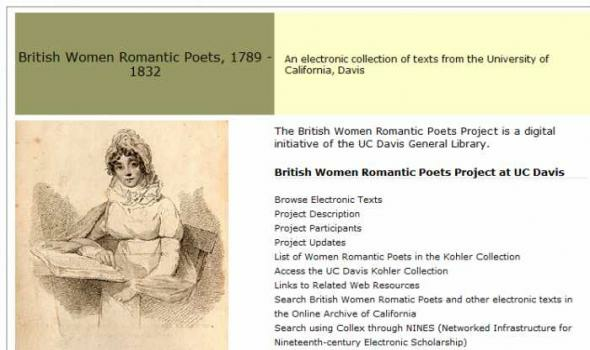 Goals The British Women Romantic Poet's Project is producing an online scholarly archive consisting of E-text editions of poetry by British and Irish women written (not necessarily published) between 1789 (the onset of the French Revolution) and 1832 (the passage of the Reform Act), a period traditionally known in English literary history as the Romantic period. Selection Criteria Texts are being selected in consultation with our Editorial Advisory Board , consisting of scholars in the United States and Canada. 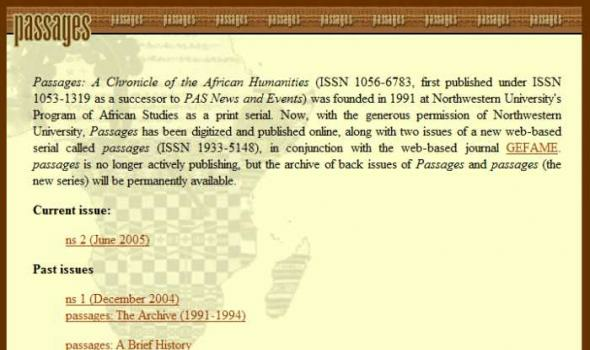 Our aim is to make complete texts available that are not readily accessible from other sources, many of which are not well known, or who are only beginning to be of interest to the scholarly community. 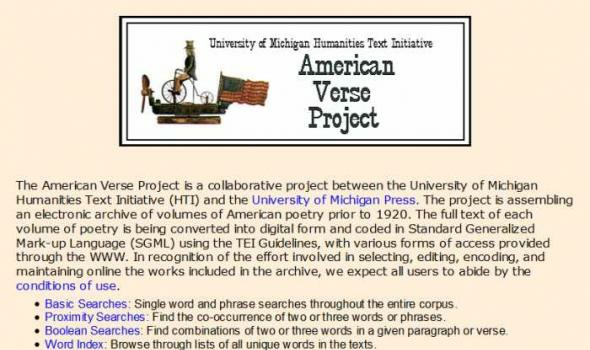 Humanities Text Initiative American Verse Project The University of Michigan Press is collaborating with HTI in an experimental venture to make these materials available to a wider audience over the Internet. 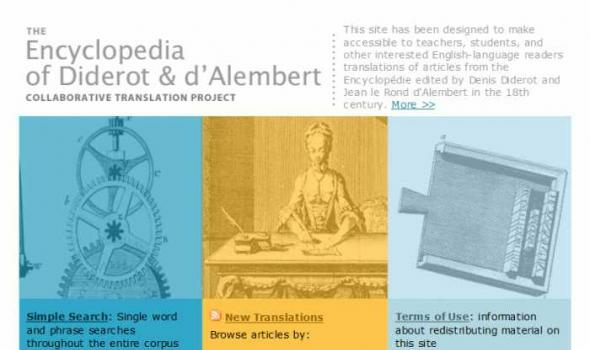 The project has several purposes: first, it allows the Press to explore new ways of providing access to World-Wide Web documents. 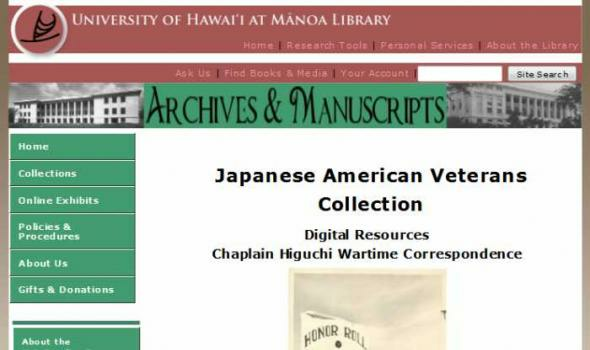 The HTI provides several levels of access to the American verse texts, and guidelines for use (2) are stated clearly at the beginning of each document. 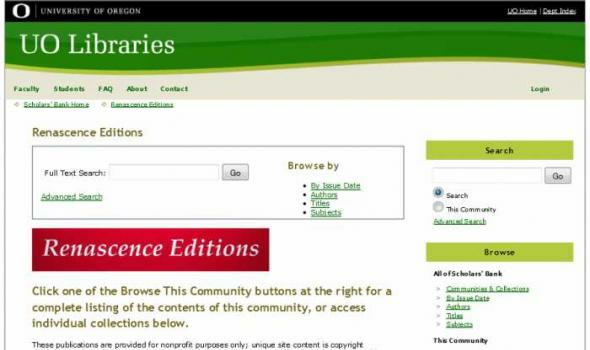 Individuals are allowed to use the texts freely, whether to create new editions, distribute to students, or use as a basis for multimedia products. 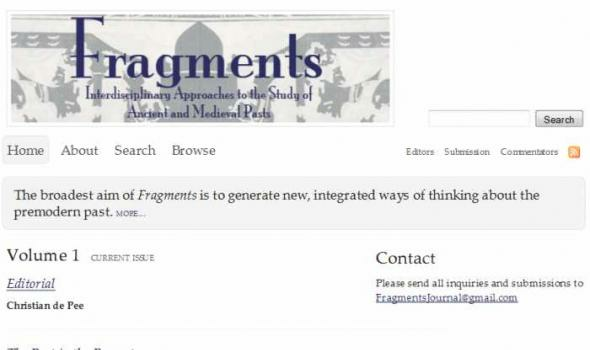 Contact Please send all inquiries and submissions to FragmentsJournal@gmail.com The editorial board is pleased to announce the establishment of Fragments , a new, open-access and peer-reviewed journal, which will be published by MPublishing, a division of the University of Michigan Library. 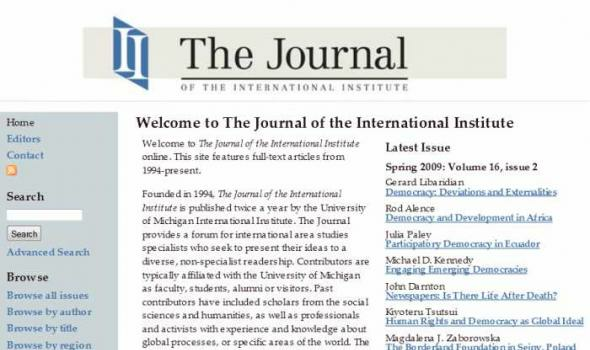 The journal's first articles were published in July 2011. Fragments will provide a forum for dialogue and exchange between scholars in all fields of the humanities and social sciences who study the premodern world. 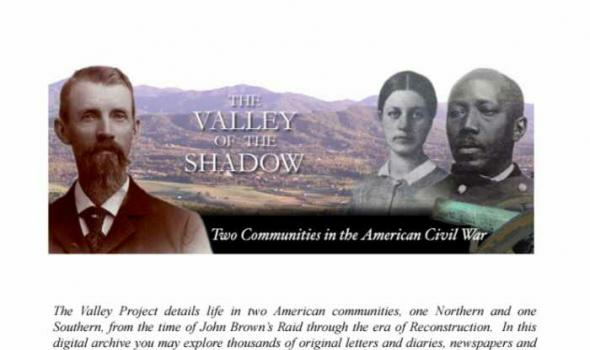 The journal encourages scholars to pursue subjects of broad interest to colleagues working in other places and times, and to pursue comparative and connective approaches in investigating the past. 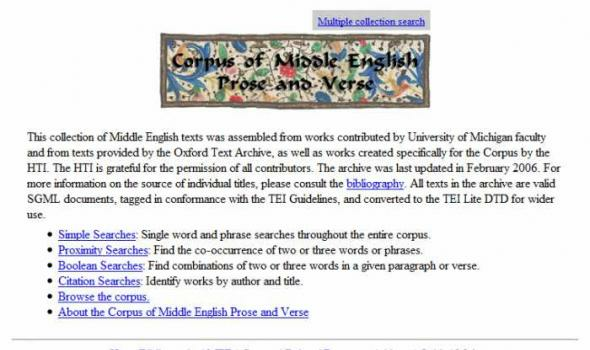 This collection of Middle English texts was assembled from works contributed by University of Michigan faculty and from texts provided by the Oxford Text Archive, as well as works created specifically for the Corpus by the HTI. 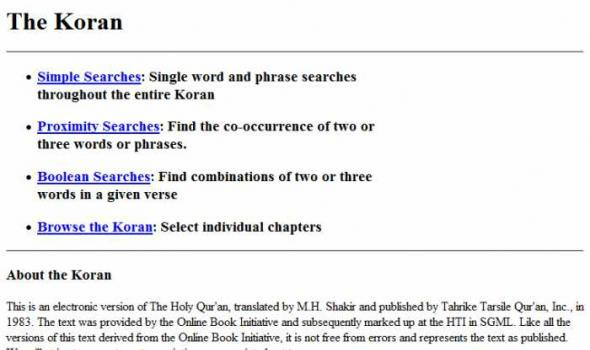 The HTI is grateful for the permission of all contributors. 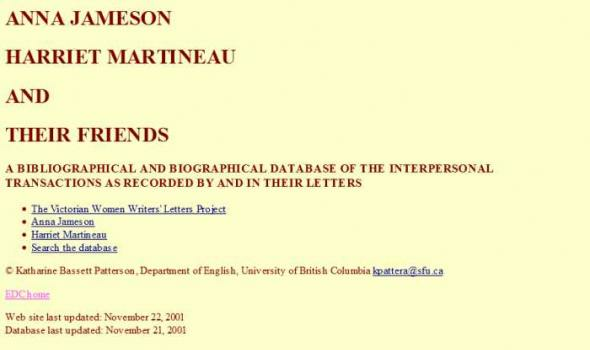 For more information on the source of individual titles, please consult the bibliography. 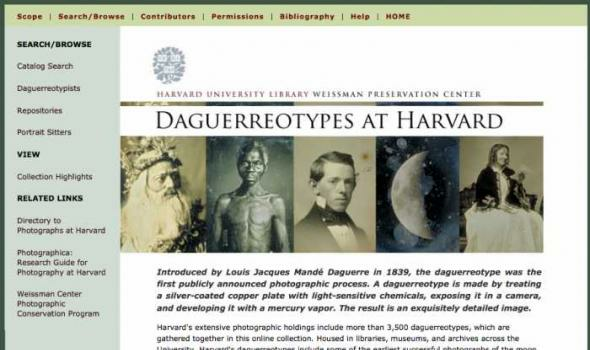 All texts in the archive are valid SGML documents, tagged in conformance with the TEI Guidelines, and converted to the TEI Lite DTD for wider use. 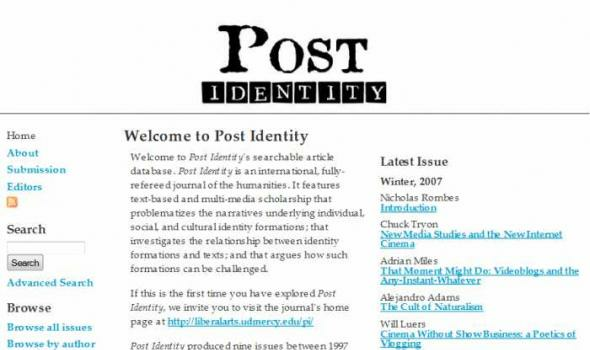 Contemporary Aesthetics (CA) is an international, interdisciplinary, peer- and blind-reviewed online journal of contemporary theory, research, and application in aesthetics. 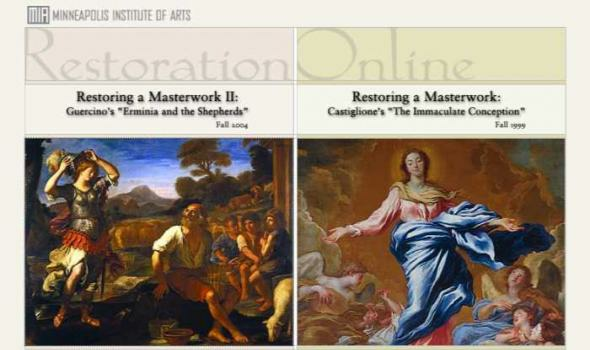 This open-access journal is published on a rolling basis, and new content is freely available on the web at http://www.contempaesthetics.org . 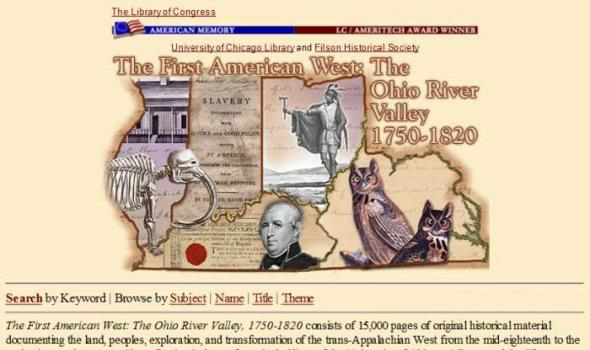 The publication is annually archived by the University of Michigan Library at this site. 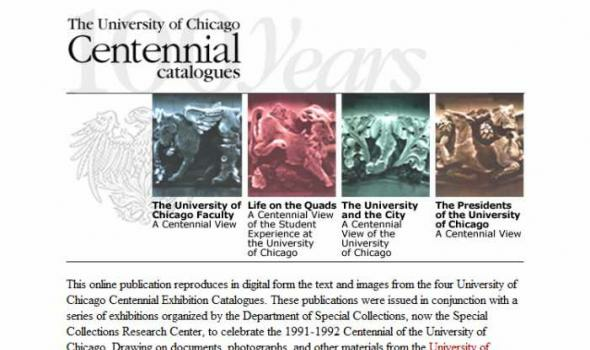 This archive consists of the whole CA backfile--from the first to the most recently completed volume --and is fully searchable and can be browsed by title, author, and volume. 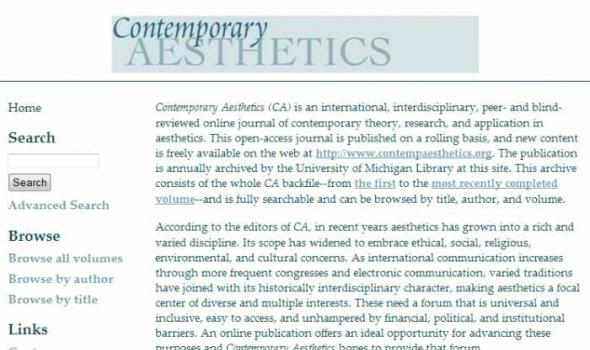 According to the editors of CA , in recent years aesthetics has grown into a rich and varied discipline. 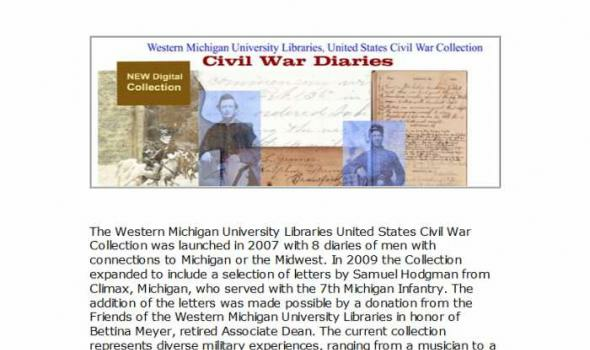 The Western Michigan University Libraries United States Civil War Collection was launched in 2007 with 8 diaries of men with connections to Michigan or the Midwest. In 2009 the Collection expanded to include a selection of letters by Samuel Hodgman from Climax, Michigan, who served with the 7th Michigan Infantry. The addition of the letters was made possible by a donation from the Friends of the Western Michigan University Libraries in honor of Bettina Meyer, retired Associate Dean. The current collection represents diverse military experiences, ranging from a musician to a prisoner of war. 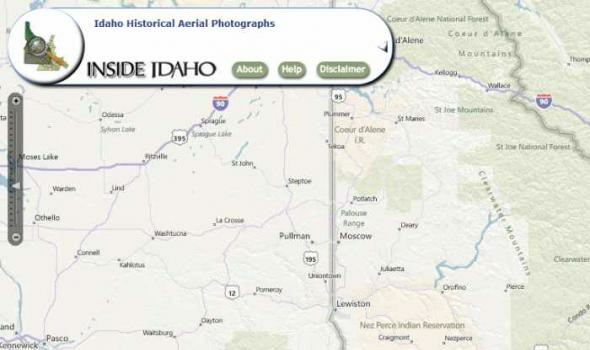 The handwritten originals have full transcriptions that are searchable with subjects. 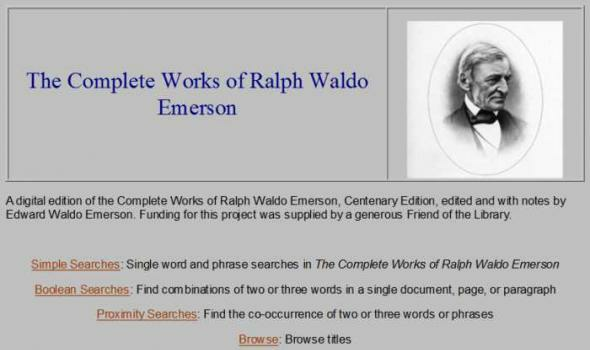 The Complete Works of Ralph Waldo Emerson Simple Searches : Single word and phrase searches in The Complete Works of Ralph Waldo Emerson Boolean Searches : Find combinations of two or three words in a single document, page, or paragraph Proximity Searches : Find the co-occurrence of two or three words or phrases Browse : Browse titles Word Index : Browse through lists of all unique words in the text. Last updated on March 28, 2006. About As a journal community, we offer the following working definitions to further delineate the scope of our medium: Our mission will be advanced by four primary drivers. 1. 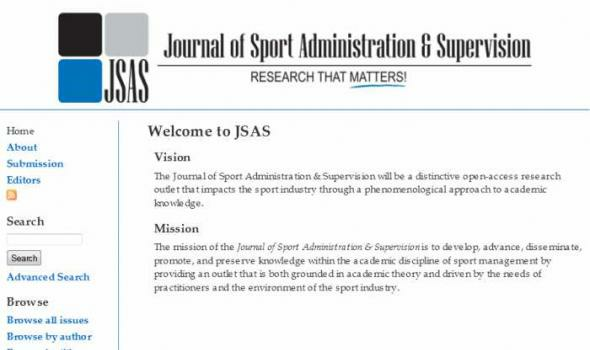 Phenomenology JSAS will shift research focus in the academic field of sport management toward a more precise study of distinct phenomena, ideas, and events. In his pioneering work regarding phenomenology in the field of philosophy, Edmund Husserl (1859-1938) attempted to shift the focus of philosophy away from large-scale theorization toward a more precise study of discrete phenomena, ideas, and events. 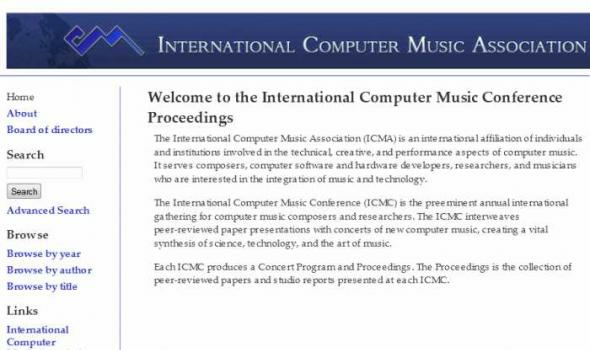 Introduction The International Computer Music Association is an international affiliation of individuals and institutions involved in the technical, creative, and performance aspects of computer music. 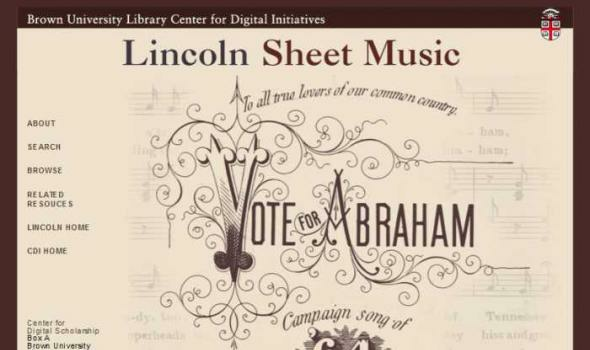 It serves composers, computer software and hardware developers, researchers, and musicians who are interested in the integration of music and technology. ICMA functions include: The International Computer Music Conference The ICMA cosponsors the annual ICMC, which, since its inception in 1974, has become the preeminent yearly gathering of computer music practitioners from around the world. 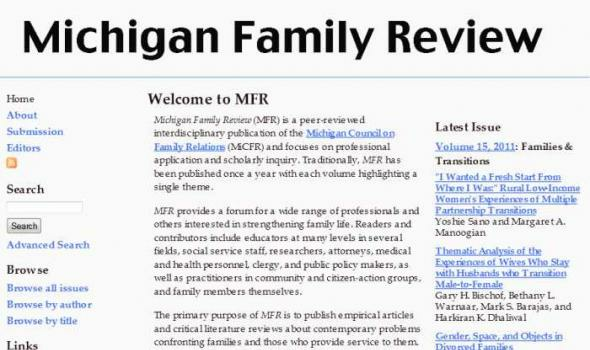 Volume 15, 2011 : Families & Transitions Michigan Family Review (MFR) is a peer-reviewed interdisciplinary publication of the Michigan Council on Family Relations (MiCFR) and focuses on professional application and scholarly inquiry. 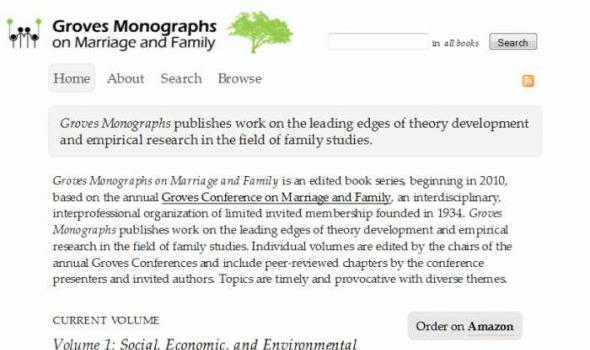 Traditionally, MFR has been published once a year with each volume highlighting a single theme. MFR provides a forum for a wide range of professionals and others interested in strengthening family life. Readers and contributors include educators at many levels in several fields, social service staff, researchers, attorneys, medical and health personnel, clergy, and public policy makers, as well as practitioners in community and citizen-action groups, and family members themselves. Proceedings of the 25th International Congress of Papyrology The 25th International Congress of Papyrology took place at the University of Michigan in Ann Arbor from July 29 to August 4, 2007. 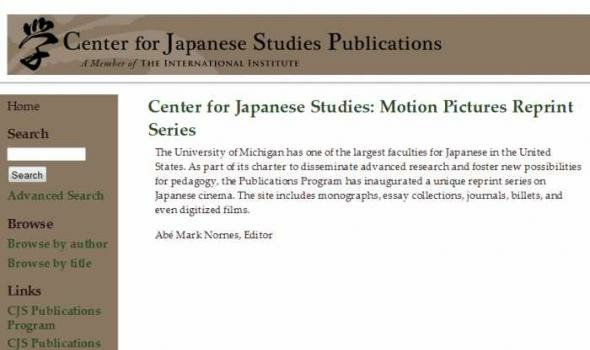 This was the second time that the Congress convened in Ann Arbor (following the 12th Congress in 1968) and the third in North America (the 16th Congress in 1980 met in New York). 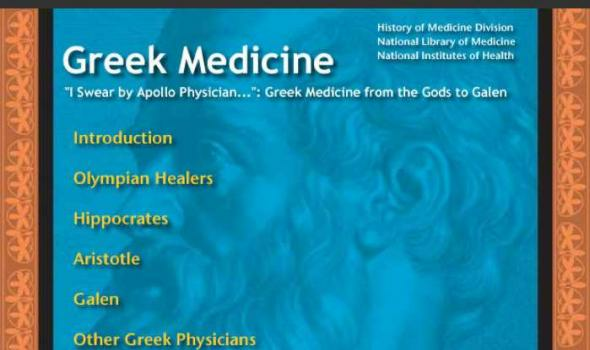 Of the approximately 150 papers delivered during the Congress, 80 fully-referreed articles are included in this publication. 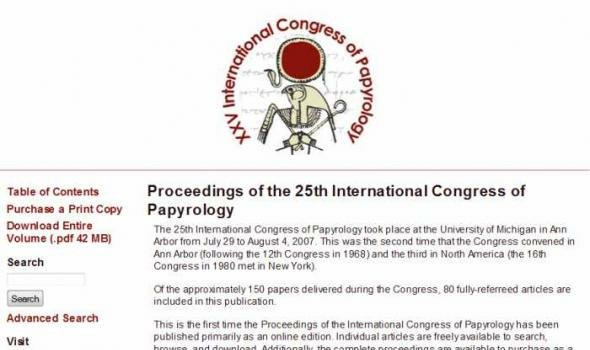 This is the first time the Proceedings of the International Congress of Papyrology has been published primarily as an online edition. 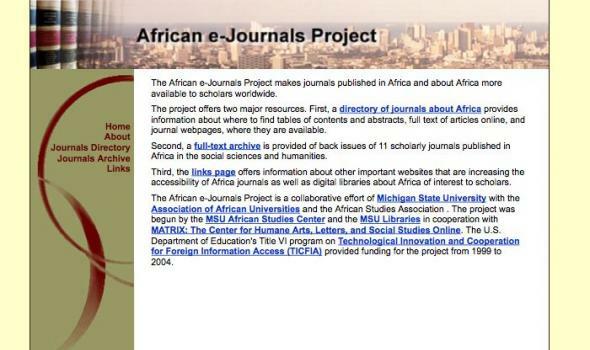 Individual articles are freely available to search, browse, and download.